The strike took place at Beilun, which is Ningbo-Zhoushan's seaport, in addition to other inland ports that make up the larger port authority. According to some estimates, it's even the largest in China in terms of capacity, surpassing Shanghai. Truck drivers participated en masse and locked down all the container yards, preventing scabs from picking up containers. They are agitating primarily for an increase in piece-rate load payments that haven't risen in 8 years, while living costs have doubled in the same period, along with oil prices. There are many images of people beaten by the police but no reports about egregious weaponry usage or really mass violence by the police. No reports were heard of any concessions any higher than the 12% rate increase offered, which is a depressing result. 10) The problem of traffic jams at the container yards, containers should be evenly distributed among yards. The industry is comprised of around 500 independent trucking companies in Beilun, but about 70% belong to a single industry association. Some truckers work directly with the companies as employees, but a majority are like North American independent contractor troqueros, who get their own trucks and register under (挂扣) a particular company (of course in the U.S. and Canada the classification of "independent-contractor" is a legal fiction). Some own more than one truck and hire others to drive for them, but also drive themselves, and in this way they earn more than being a company employee. According to a report by a Chinese labor scholar, pay is roughly 8000 yuan per month for an employee and 10,000 for someone with their own truck, but another earlier report said its only 5-6000 per month. Both reports suggest trucking fees per haul are roughly 200 yuan, some 3/4 of which disappear in oil costs, road tolls, and other fees during the journey, leaving a few hundred for the driver, but also this must also be used to pay for vehicle maintenance. Each driver is contracted for a particular route, similar to the way rural bus systems work. They don't get to see each other a lot, and runs tend to take up full days. Some aftermath of the strike, Beilun freeways have been jammed for a week due to increased traffic trying to catch up with the backlog. Four of China's five largest ports have seen strikes in the past 3 years--Shanghai truckers in 2011, Hong Kong and Shenzhen dockers last year, and Ningbo now. Just as quickly as this strike exploded it disappeared with almost no trace. The Ningbo government enforced a complete news blackout, making it even more difficult to follow the aftermath of the strike. On August 20th, in Zhejiang's city of Ningbo, the port of Beilun's container truckers' strike is in its third day. The number of drivers of strike is approaching 10,000, and they continue to block roads to stop all remaining operating vehicles. At noon, after police arrested two demonstrating drivers, intense conflict broke out between several thousand drivers and several hundred police, several trucks and police cars were smashed and many drivers were beat up and arrested. At present, drivers and police are at a stalemate. 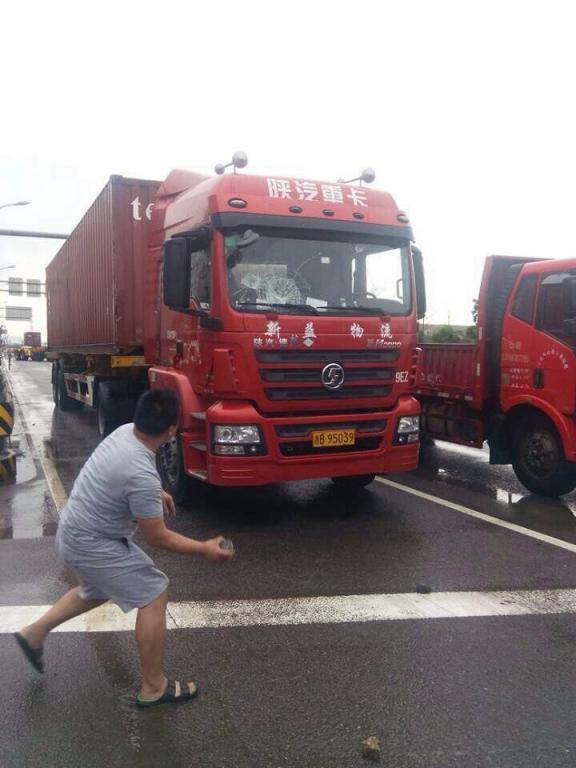 Due to shipping payments having stagnated for 8 years, Beilun's port truckers started striking on August 18th. The port of Ningbo has been shut down by the driver teams' strike. According to the latest updates, on Beilun Way, vehicles are being stopped, smashed, and seized, entirely preventing regular logistics companies from operating. Demanding survival and increased payments, Ningbo container truck drivers are on strike. Drayage payments have not increased in eight years. We can't take it any longer. We need to survive. Three days into our strike, the special police [equivalent to SWAT teams] have started to come out and beat people. Is there still heavenly justice this year? Where is the justice? The port of Ningbo's container truckers are in the third day of a broad strike. How will foreign trade go on? Have all of our Ningbo freight forwarding friends been collectively resting these past few days? Ningbo Beilun's container [trucking] industry strike, cars smashed, thousands assembled. A large deployment of special police beating and arresting people. Freight hasn't made it out in two days! It's war in Beilun! According to revelations from a related government official, this strike has already set the entire province of Zhejiang on alert. Every freight forwarder, factory, and even the government is watching. If they don't succeed, container [truckers] will fact all kinds of crises. If I may offer a piece of advice to all the non-locals [migrants] of Beilun's handling companies, you must stick together and be united. Turn your forces in the same direction. Don't secretly pick up containers. Your gamble will result in huge losses for this strike! We are all non-locals, locals will not respect us. Friends with courage and uprightness, keep it up! Staunchly press for increases in Ningbo city's container drayage rates! The special police are retreating, safe and without incident. The cries sound out again, the special police go again. A bunch of special police are at the scene. "Brothers hold it down for me! Those of you across the street, if you don't move I'll hit you with the cannon!" "What are you surrounding this empty space for?" Ningbo Beilun's drayage payments have not increased a wit in 8 years. Finally a collective drivers' demonstration and strike has erupted. 80% of Beilun's container trucks have stopped operation. This is the strike of the Beilun Port bonded area of Ningbo. Police and special police, you are powerful! What?! What?! Container truck drivers on strike?! Mass incident, they say it's because wages have not gone up in 8 years, too crazy! Using containers to block roads and throwing rocks at police from on top of the containers, that's too much, a serious disturbance of order, the roads have already been closed! Will people be detained? The situation is getting more and more serious! Everyone be rational! The clouds over Beilun---war movie. Ningbo drivers strike, it's already fought with police, the situation is even more intense than the last two days! Beilun container truckers strike to survive, they call in martial force to suppress. Justice is in the people's hearts. Ningbo's Beilun Port, container truck drivers are on strike. Today is high tide. Currently the rogue masses are assembled, whoever dares to pick up containers in the port area if they're lucky will have their container snatched, if they're not will have their car smashed and be beaten. This is a strike? A strike that obstructs exports, the whole world knows, but weibo [Chinese social media] doesn't know, Ningbo nightly is sleeping and the Daily is on vacation, Ningbo is publishsing Beilun vacations and Ningbo good eats, the world goes on peacefully, how wonderful! On August 18th, in Ningbo City, Zhejiang Province, because drayage rates have not gone up in 8 years, several hundred Beilun port drivers went on strike demanding increased drayage rates. By the 19th, 60% of Ningbo's container truck drivers had joined, striking trucks reached several thousand, all of Beilun's container yard entrances were blocked, the main entrance to the port was covered with tacks, several vehicles that had not joined the strike were smashed and container pick-up was completely paralyzed. A large deployment of police was on the alert. Bump! This is important and hasn't received enough attention.